(comparative coars·er, superlative coars·est) adjective 1. rough: harsh or rough to the touch 2. indelicate or tasteless: lacking taste or refinement 3. vulgar: vulgar or obscene 4. unrefined: not refined coarse metal 5. inferior: of inferior quality [14th century. Origin ?] -coarse·ly, adverb -coarse·ness, noun coarse or course? 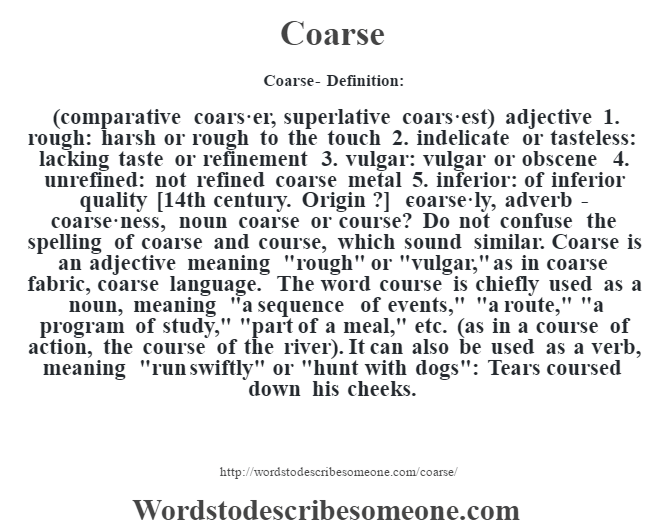 Do not confuse the spelling of coarse and course, which sound similar. Coarse is an adjective meaning “rough” or “vulgar,” as in coarse fabric, coarse language. The word course is chiefly used as a noun, meaning “a sequence of events,” “a route,” “a program of study,” “part of a meal,” etc. (as in a course of action, the course of the river). It can also be used as a verb, meaning “run swiftly” or “hunt with dogs”: Tears coursed down his cheeks.